Print up these fun tags by clicking the “Download Here” link above. Hosting a Halloween Party? Give your party food some freaky names. Cut out the cards on the dotted lines. Then fold them in half and set on a table. Place them next to your snacks on fright night. Then tell your guests to go ahead and eat—we dare you! Witch’s Warts, Ghost Poops, Monster Teeth, Frankenstein Fingernails, Goblin Ears and Scary Scabs might make you lose your appetite if they weren’t really fruit and nuts in disguise. 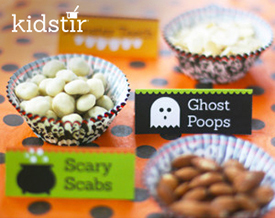 How could you ever plan a fun Halloween party, make wonderful scary halloween snacks for all the kids and not print these funny spooky labels to be sure everyone knows what gross things to imagine they are eating? You’ll be ready to go on your Halloween scavenger hunt after devouring those healthy snacks. Make sure you learn about the Kidstir Spooky Celebration Kit in time to prepare the Spaghetti and Eyeballs for Halloween dinner.